Jersey City’s ethnically-diverse West Side neighborhood is undergoing a massive transformation, thanks in part to a recently-approved redevelopment plan that will incorporate the community’s needs with those of New Jersey City University. A planned annex to New Jersey City University’s (NJCU) main campus, the 21-acre NJCU West Campus will be much more than a typical university campus – it will also be a place for city residents to work, shop, and live. It is part of the city’s broader redevelopment plan in the hopes that the construction will help to bring the prosperity seen along Jersey City’s Hudson River waterfront to another part of the city. 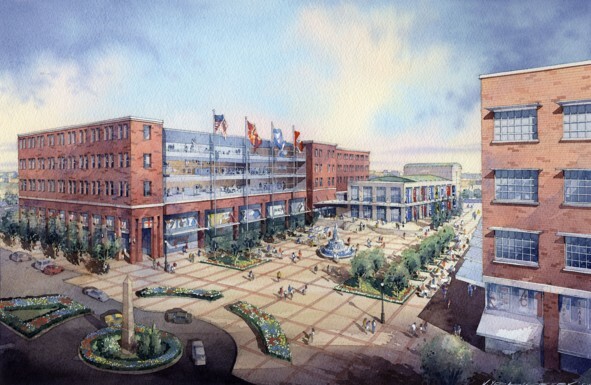 When fully developed, the project will include over 200,000 square feet of retail space, a parking garage, housing, academic teaching spaces, academic office spaces, a performing arts center, and primary and secondary schools. The buildings will be organized along a new street grid, clearly defined by the building facades, with sidewalks connecting a variety of public spaces. To create a unified character, the buildings will share materials and articulation, but the massing of the different building types will provide variety. While the site’s previous industrial uses left it contaminated with chromium, lead, arsenic, and mercury (it is currently undergoing remediation and abatement activities), it also left it with a rich architectural legacy that was used to determine the aesthetic character of the project. The mix of uses on the site will be unified by adopting the sturdy brick construction of the classic industrial buildings found throughout Jersey City. Easy public transportation access was a main consideration in selecting the site. City buses run along the adjacent streets, and a light rail station is within close walking distance. Additionally, NJCU will operate a shuttle bus to its other campus and the light rail station to encourage students and employees to leave their cars at home. Most of the site’s parking will be placed in a mid-block parking structure so it will not be visible from the streets. Currently, the site is one large parcel without any internal streets. The new planned street grid creates a series of smaller blocks that are more easily developable and more appropriately scaled for pedestrians and provides easy access to the site from the surrounding neighborhoods. Many of the streets will be lined with ground-floor retail to stimulate street life. The mix of uses will ensure that people are actively using the site at all times of the day, promoting both a sense of place and security. The city and NJCU made sure that the community was actively involved to ensure that the project was fully integrated into the existing neighborhood. The West Campus plan is part of the much larger Bayside Master Plan for the West Side of Jersey City which was developed through a participative design process involving over one hundred community stakeholders. Drawing on the Bayside plan, the project team collected input from three groups. Stakeholders from the surrounding community gave input on local concerns and needs, faculty and administration from New Jersey City University detailed academic requirements, and a developer, hired by the NJCU, produced a market study to determine the types of spaces that would attract retailers. The project team used these sometimes conflicting requirements to develop a program which became the basis of a preliminary site plan. Multiple meetings with the stakeholders enabled the project leaders to balance the needs of the city, the university, and the community – and the result is a plan that takes into account the economic realities of developing a contaminated urban site while also providing a mix of uses and the public space necessary for long-term viability and integration into the neighborhood.